So far September is starting off well for Active Trend Trading! Last Wednesday’s training webinar was about doing Super Charged Covered calls with certain stocks and Index ETF’s. Beginning this weekend I will provide weekly updates on how well our TSLA trade is doing since we purchased shares on 7/31/14. Trade alerts for the covered call and special option trades will continue to go out to the members that opted in to this the special trade mailing list. If there are any other Premium Members who would like to be included on this list, please drop me a note. Thus far the TSLA trade is up 37.35% since July 31st. General Market Observation: One can make a case for the market going either direction moving into next week. The Confirmed Uptrend is still intact but the number of distribution days increased by two this week for both the Nasdaq and S&P. 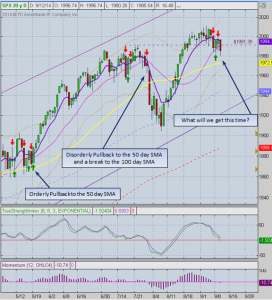 Both Indexes sit with 3 total distribution day since the uptrend resumed on August 13th. Over the past couple of weeks the Indexes have been doing a repeat performance of bouncing between support and resistance almost on a daily basis. With each assault on the upward sloping moving averages the slope of those moving averages is hammered over. If this is a topping formation eventually the price action will retreat to these moving averages and one day the buyers will not step in and the price will slip down the slope of the moving averages. For homework check out the S&P chart from Sept-Dec in 2012 and 2013, it sure seems like a similar pattern is setting up! In both years the S&P turned over on 9/14 and 9/19 respectively…patterns do repeat. This does not mean the longer term uptrend will be foiled, but it could mean it’s time to take some profit off the table and wait for the momentum to get under a new upward move. For those who like to trade to the downside there may be some opportunities right around the corner. Remember to remain flexible because patterns do repeat, except when they don’t. When they don’t something new is happening. SPX: With prices closing below the 20 day SMA the probability that price will move to the 50 increases and goes to almost a certainty if support at 1980 is violated! Right now the pullback has been orderly but can turn disorderly in a flash. The daily chart below shows two forms of pullback; one orderly and one disorderly a bit more vigor to the downside. The fact is we will not know which type we get until it actually happens. A case can be made for both. Again remember while these brief pullbacks may provide short term downside trading opportunities or at least a clue to take some profit off the table, we must believe that a pullback will result in a buying opportunity. When this pattern of pullbacks is broken then we will know there is a more significant change going on! Nasdaq 100: The simple analysis is there is support at 4050ish and a break and close below this support zone may lead to a pull back to the 4000ish level. Like the S&P momentum remains in a downtrend and there is negative divergence on the Weekly indicators. A 38% retracement from the recent highs provides a downside target of 3845 which is a strong support area. 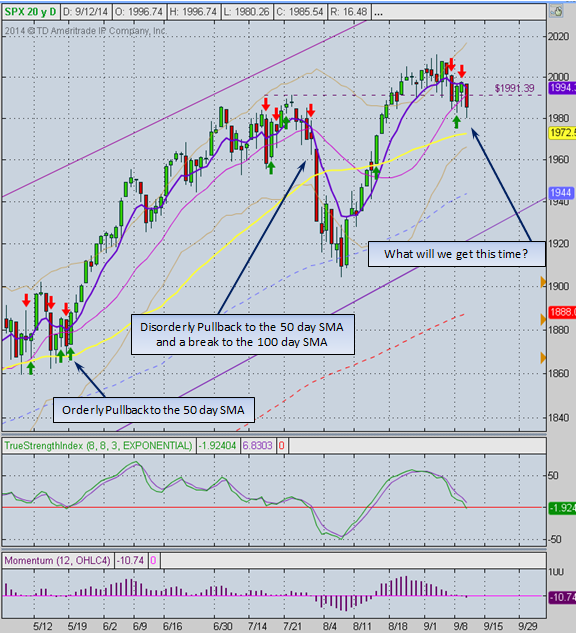 Right now we do not know if the Nasdaq 100 will complete the rollover or just sit at current levels moving sideways. A close below the 20 day SMA will increase the probability of a more significant retracement! RUT: The Russell may provide a better downside tradable opportunity if the NDX falls. Of all the Indexes its potential to the downside is greatest from what the charts are showing. Friday’s sell off was a bearish candle but not a particular bearish candlestick pattern. Price continues to hold support just above the 50 day SMA which has now turned over and has a downward trajectory. One of the next few assaults of the 50 day may result in sliding down the slope. Note for Active Trend Trading Members: I try to maintain neither a bullish nor bearish bias in my analysis each week and simply provide observations of how the price action is behaving. If the observable clues stack up to favor sellers then I will move in that direction. However if anything changes in the price behavior I evaluate how the convergence of clues and can switch directions quickly. In other words we attempt to be on the correct side of what the traditional technical analysis tools are showing! This list of closed trades includes the Super Charged Covered Call trades on TSLA. Alerts on potential TSLA trades are now going out to members who want Special Option Trade notification. The spreadsheet shows total closed trades in September 2014 and thus far this month the option trades have provided greater opportunity than traditional stock and ETF trades. This too goes in cycles. For our new Active Trend Trading Members here’s how we utilize our trading capital. Outs & Ins: Not much movement on the IBD 50 over the weekend, just a reshuffle from the Running List of all stocks that have been on the IBD 50 sometime during the year. Again as reminder we track the Running List because often stocks that fall off the IBD 50 list will base and provide some excellent early entry Action Points. I go through the Running List over the weekend to see if anything looks promising. Remember that if the market does become more negative, the IBD 50 and Running List also provide excellent opportunities because high octane growth stocks go down even faster than they go up. 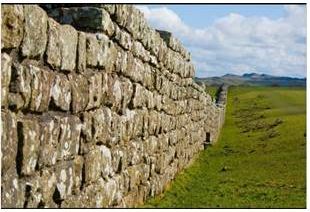 Off the Wall: This weekend I was thinking a bit about Persistence, Preparation & Providence. Perhaps it was because I attended my 45 year high school reunion down in Salinas, California. I had a chance to chat with some of my former classmates and hear their “after high school” stories. While time has not stood still for any of us it seems that the years have been kinder to some. One of the stories that really caught my attention was Diane’s. She was one of the brighter students in our class and she now has her doctorate in mathematics and teaches future teachers about how to teach math. When she graduated, her father didn’t think that girls should go to University. His plan for her was to work in the family printing business taking over the book keeping duties her mother had performed for the company. Diane saw a different future which included 4 year teaching degree. After finishing community college, her dad said that’s it time to go to work in the family business. Diane said no and transferred to Cal Poly. Her folks stopped supporting her education effort, so Diane got a job and worked 40 hours a week while she completed both her undergraduate and graduate degree in 2 years! She later went on to gain her doctorate in mathematics and became a premier math teacher. Amazing story of persistence and preparation! That evening as I took a look around the room and listened to many stories it was also interesting to observe that providence also played a role in who was successful and who wasn’t. Success had very little to do with talent or appearance or perceived potential at graduation. The friends and classmates who were “most likely” to succeed didn’t and those who were the “overlooked ones” turned out to be most successful. For those who succeeded there was three clear ingredients that seed to propel them-persistence, preparation and providence.